Urbana Chapter Registrar Betty Driever received The National Society of the Sons of the American Revolution Medal of Appreciation for outstanding genealogical assistance. Mary Pollock’s son, Col. Robert D. Pollock, president of the District of Columbia State Society of SAR, nominated Betty. Mary’s granddaughter Lexi made the presentation. From left are Lou Driever Jr., Betty Driever, Lou Driever, Lexi Pollock and Mary Pollock. On Monday, June 15, 2015, the Urbana Chapter of the Daughters of the American Revolution met for their annual potluck meal at 11:30 a.m. at the Champaign County Historical Society. Twenty-five members and six guests were greeted by Regent Judi Henson. Guests present were Jean Muetzel, OSDAR Southwest District Director; Terry Whetstone, Sons of the American Revolution, George Rogers Clark Chapter; Lou Driever, Sr.; Lou Driever, Jr., Manager of Grimes Field; Cathy Harris (daughter-in-law of Mary Pollock, wife of Colonel Robert Pollock), and Vincent Foulk. Chaplain Lana Seeberg said the blessing before the meal. SAR member, Terry Whetstone, told the group about their activities involving school age boys and girls participating in writing historical essays and other projects. He said there were 25 SAR chapters in Ohio and 50 SAR chapters overseas. Lou Driever Jr., manager of Grimes Field gave a brief history of the airport. He explained some new ideas that will be implemented and discussed the 50th Vietnam celebration that was held on Saturday, June 13th. Lou is the son of our registrar, Betty Driever. Member Mary Pollock and her granddaughter, member Lexi Pollock presented The National Society of the Sons of the American Revolution Medal of Appreciation award. Mary’s son and Lexi’s father, Colonel Robert D. Pollock, President of the District of Columbia State Society of SAR, nominated a member of the Urbana Chapter DAR for this award. It is the only Sons of the American Revolution Medal that can be presented to a member of the Daughters of the American Revolution for recognition and appreciation for outstanding service. It is the second highest honor that can be confirmed upon a Lady, and is the mandatory precursor to the highest honor. This medal was presented to Urbana Chapter Registrar, Betty Driever in appreciation for her genealogical assistance which has resulted in an increase in the District of Columbia State SAR and the Ohio DAR. The medal is gold in color and bears on the obverse a relief of Molly Pitcher. It is inscribed “Medal of Appreciation”. The medal is suspended from a ribbon of the Sons of the American Revolution colors. Following the presentation, Regent Henson told the group of special June dates and then began the opening ritual. OSDAR Southwest Director, Jean Muetzel led us in the American’s Creed and the Pledge of Allegiance, followed by the singing of our National Anthem. President General’s Message – Judy Brooks read information about the DAR’s 125 years of service to America and hoping members will plan to participate in some way on October 11, 2015, National DAR Day of Service. National Defense – Margaret Denzer read from the National Defender about the establishment of the Marine Corps Women’s Reserve, on February 13, 1943. Judy Brooks introduced our speaker, Jean Muetzel, OSDAR Southwest District Director. Jean spoke about Colonial Toys and Games and told us that most toys were handmade, but some were beginning to be manufactured. Some of the games we still have today are Jacobs Ladder, Nine Pins, Tag, Ring Around The Rosy, and Goose Goose. Jean had Brandon Ebert (CAR member) and Megan Snyder, (prospective CAR member) demonstrate how some of the games were played. Brandon is the grandson of member Janet Ebert and Megan is the daughter of member, Kim Snyder. Brandon Ebert told the group about an amazing event in which he was honored to participate. Brandon and another classmate were chosen to lay the wreath on the Tomb of the Unknown Soldier when the 8th grade Urbana Junior High School went to Washington D.C. in May. Though they were not allowed to touch the wreath personally, they walked with the guards to the grave. Brandon said it was “very awe inspiring”. Regent Henson then called the business meeting to order. Audit Committee – Judy Brooks will have reports ready for Jami Hackworth and Janice Coates in July. Budget Committee – Regent Henson and treasurer Judy Brooks will review and prepare the budget for 2015-2016. Registrar – Betty Driever reported 79 members, 11 associate members, 7 prospective applicants and 2 applications waiting approval in Washington. Historian – Janet Ebert reported that the Heritage Project, which is to clean-up selected cemeteries in the county, is continuing. Librarian – Margaret Denzer reported that the DAR library was featured on the TLC program “Who Do You Think You Are?” Actor Bill Paxton used the library for genealogy resources to trace his ancestors. The OSDAR Fall Fun Fair will be Saturday, August 15, 2015 at the Columbus Airport Marriot Hotel. Reservations must be in by August 6. President General Lynn Forney Young will be in attendance. Forms are available in the Ohio DAR newsletter. Go to www.members.ohiodar.org/newsletters/June2015/Fall Fun Fair Forms. Please give your reservations to Judi Henson. American Indian – Carol Tong told the group that the term “highways” came from the trails made by animals and how the Indians used these to navigate the terrain. CAR – Janet Ebert reported that the book project was quite a success. They delivered 36 boxes of books to various places in Columbus. DAR Service for Veterans – Mary Pollock thanked the group for bringing items for the Dayton VA. Flag of the United States – Dolly Wisma spoke to the chapter about historical flags of various designs and told information about each one. She also showed our US flag from past to present. Vietnam War Commemoration-SITREP – Margaret Denzer read that the Vietnam Veterans Memorial Fund WMF’s steadfast commitment to presenting their traveling “Wall that Heals” and their collaboration with Commemorative Partners in communities across the US has resulted in more than 114,000 Vietnam veterans and their families being recognized in 2015. Volunteer Information Specialist – Kim Snyder reported that the new Urbana Chapter website application was at National and we are waiting for their approval. Regent Henson reminded the group of the organizational meeting for August 17 at the First Presbyterian Church at 1:30 p.m. All are asked to attend. As June is the end of our fiscal year, Regent Henson thanked the members for their hard work and dedication to the Chapter that made the year such a success. Regent Henson thanked the hostesses for today: Becky Shultz, Dianne Burroughs, Kim Snyder, Jan Forsbach, and Amy Marsh. Chaplain Lana Seeberg closed the meeting with a Flag Day prayer. 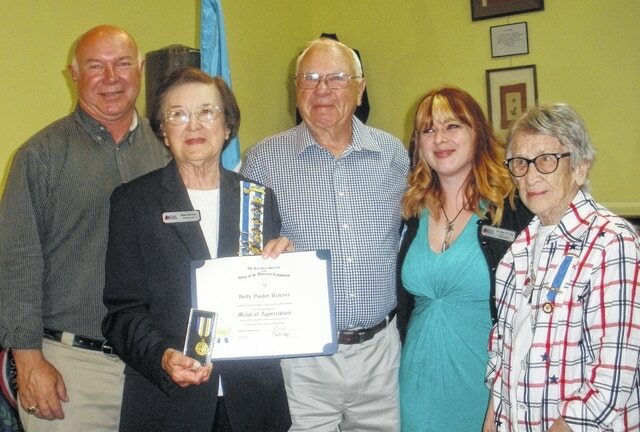 https://www.urbanacitizen.com/wp-content/uploads/sites/36/2015/07/web1_Driever.jpgUrbana Chapter Registrar Betty Driever received The National Society of the Sons of the American Revolution Medal of Appreciation for outstanding genealogical assistance. Mary Pollock’s son, Col. Robert D. Pollock, president of the District of Columbia State Society of SAR, nominated Betty. Mary’s granddaughter Lexi made the presentation. From left are Lou Driever Jr., Betty Driever, Lou Driever, Lexi Pollock and Mary Pollock. Submitted by Urbana Chapter of the Daughters of the American Revolution.